Description:- Phillipa Knickerbocker Glory is a beautifully illustrated children’s picture book targeted towards the 3-6-age range and is the debut picture book by published Children’s Author Sarahjane Funnell. Review:- I wasn’t sure about this book when I first received it, it looked very girly, very, very girly, so I didn’t expect the boys to want to read it with me, boy was I wrong. My oldest who is 5 and who’s favourite colour is pink absolutely loved it and wanted it read over and over again. The story is a good one about a girl who loves ice-cream and goes off on an ice-cream adventure, in which she gets to eat all the ice-cream she wants. She soon realises too much of a good thing isn’t all it’s cracked up to be and decides that she is too sick of ice-cream and moves onto something else. The pictures are delightful and work well in the book. The only thing I have to say is I think that the little girls name which is Phillipa Knickerbocker Glory is used way too many times. I am sure I counted it used three times in the one sentence. I ended up no longer saying her name and using she and her. Her cat’s name is also a bit of a mouthful as Little Miss Whiskers. If you can get over the long names, this is a delightful book one that little girls will adore. It’s all pink and she has a gorgeous tiara. But, it’s not just for little girls as my boys have proven, they love it just as much. It’s a great story for bedtime reading, short enough to keep them interested and not too long that it keeps a sleepy child awake longer than needed. Plus the children can relate to the gorgeous big ice-creams. 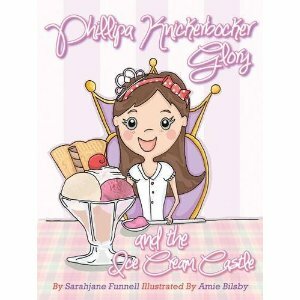 Check out the Phillipa Knickerbocker Glory Website for more information and to purchase. Disclaimer:- I was sent this book from the author in exchange for my honest review which I have given above.